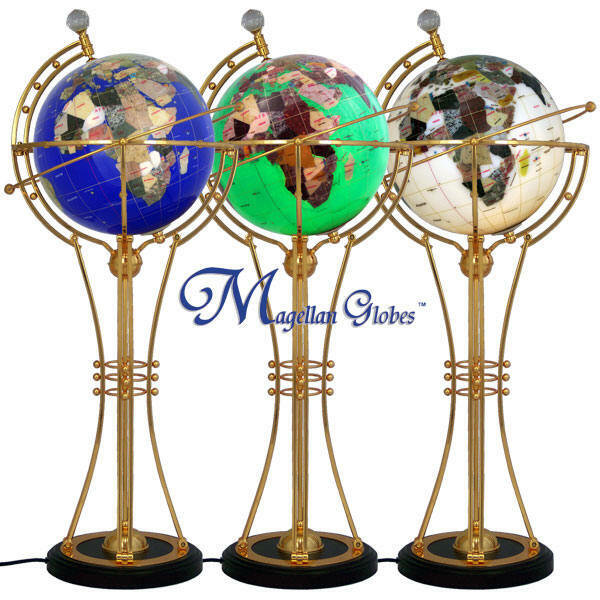 Gemstone globe is handmade with a variety of semi precious stones that are individually hand carved to represent each country. With the flip of a switch, the already beautiful globe becomes truly breathtaking! The translucent oceans glow and the semiprecious gemstones come alive as they are bathed in the soft internal lighting. All the while the globe rotates continuously to provide an unobstructed view of every aspect of your beautiful Gemstone Earth Globe. The Nova is available in a comprehensive selection of ocean colors. Choose Ivory, Lapis Blue, or Snow White in solid ocean colors, or Cambridge Blue, Emerald, Rose Red, or White, in pearl ocean colors. Meridian, longitude, latitude and international date lines are added with a fine gold thread. Floor Stand Care: On the metal stand or arch, use a soft cotton cloth with a very small amount of hand lotion to remove fingerprints. Use a clean, dry cloth to wipe away the lotion and shine.